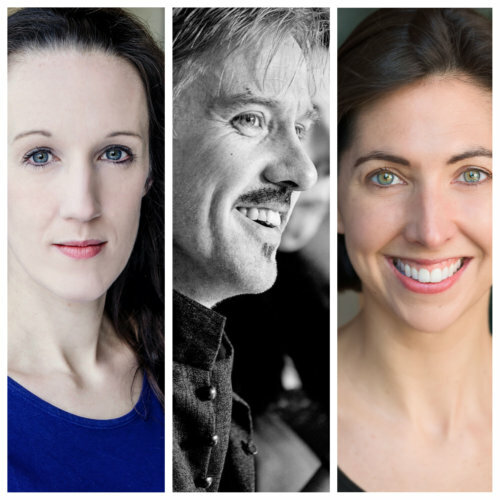 Unwritten is a group of three incredible improvisers, Charlotte Gittins, Lauren Shearing and Seamus Allen. Charlotte is an actor, documentary-maker and BAFTA Rocliffe-winning writer. She is one of the cast of award-winning UK show ‘Austentatious: An Improvised Jane Austen Novel’, performing in London’s West End, on BBC Radio 4 and on tour. Internationally, she has guested at festivals across the world, both on her own and as half of critically acclaimed double act ‘Folie à Deux’. In London, Charlotte is one third of ‘Grand Theft Impro’ and all-female acts ‘JCB’ and ‘Anxiety Club’. Her recent guest appearances include ‘The Glenda J Collective’, ‘Questing Time’ and ‘Suki Webster’s Guest Speaker’. She has acted and improvised by candlelight at Shakespeare’s Globe, performed her own solo scripted show at the Edinburgh Festival Fringe, and survived many 50-hour Improvathons alongside Lauren and Seamus. Off-stage, Charlotte writes, makes documentary films for the BBC and Netflix, and teaches improvisation at London’s prestigious Actors’ Centre. Lauren is a cast member of the Olivier-award winning ‘Showstopper! The Improvised Musical’ and performs regularly with the company in the West End and across the UK. She has appeared as a guest with the acclaimed improv comedy play ‘Austentatious: An Improvised Jane Austen Novel’, as well as with the renowned ‘Comedy Store Players’. Lauren also performs in the two-person improv show ‘Breaking & Entering’ with Maria Peters. Together they co-founded ‘The Playground’, one of London’s leading improv comedy nights, which showcases new female talent, as well as bringing together some of the most experienced improvisers in the country. Highlights of her other guest appearances include ‘Grand Theft Impro’ and ‘Suki Webster’s Guest Speaker’, as well as the legendary London 50 Hour Improvathons with Extempore Theatre. Seamus is an actor, director, dramaturge and acting coach. He trained in Dublin at the Conservatory of Music and Drama. As an actor, he has toured extensively throughout England and Ireland, working in Irish Classics, devised clown theatre, children’s theatre and open-air Shakespeare. Seamus still performs as a comedy improviser, having been mentored by Ken Campbell, and is a core member of the annual London 50 hour Improvathon. Currently, he runs the only improvisation comedy club in Reading, “What’s the Game?! Improv”, hosting shows as well as coaching professional performers. Seamus works as a director of plays and musicals. He is director of The Young Company at the Watermill theatre in Newbury, and has developed advanced actor training programmes for Stagecoach Performing Arts, and Best school of acting. In a world as absurd & thrilling as it is tragic, three characters’ lives slowly unravel… It’s 1929. Society is on the edge of a Great Depression. Talking pictures are slowly killing silent movies. The air resonates with wild music, pretty words and unspoken dreams. Inspired by the audience, Charlotte Gittins, Lauren Shearing & Seamus Allen create a play from scratch. Hilarious, touching and emotionally daring, nobody knows how this will end. Only one thing is certain: the world of 1929 is about to change forever.